You’ve heard of rhubarb pie, rhubarb jelly. Maybe even rhubarb crisp. 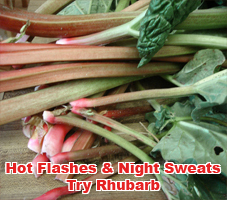 But rhubarb to stamp out hot flashes and night sweats? No, not by blending it into a cool drink, or by dabbing a cool concoction onto your sweat-soaked skin, but by ingesting Estrovera, a special extract of rhubarb that contains ERr 731, a substance extracted from the roots of the rhapontic rhubarb, or the Siberian rhubarb. As menopause approaches, estrogen levels fall and women may experience various symptoms, including hot flashes, depression, irritability, anxiety and night sweats, to name a few. Traditionally, women have been placed on standard hormone replacement therapy, which, although effective, carries with it an increased risk of heart disease, breast cancer and stroke. In recent years, researchers have worked to develop safer alternatives. Rhubarb has been used in traditional Chinese herbal medicines for centuries, to heal constipation, diarrhea, fever, menstrual problems, jaundice; and when applied topically, to heal sores, ulcers, and burns. Rhubarb is considered a phyto-estrogen—a plant with estrogen-like qualities. Rhubarb root contains lindleyin, the estrogen-like substance. ERr 731, contained in Estrovera, has been used in Germany since 1993 to treat menopausal symptoms. In 2008, American researchers decided to give it a try. They studied 252 women for six months. Women taking ERr 731 more than halved their Menopause Rating Scale scores. Their health-related quality of life scales shot up too. A 2009 study examined 109 women, half of whom were taking the active ingredient in Estrovera, ERr 731. Within a week, participants taking ERr 731 noted a significant improvement in their menopausal symptoms, which continued for the 12-week study duration. Rhubarb contains large amounts of oxalic acid, mostly in its leaves, which can cause kidney stones. However, the root is most often used to treat menopausal symptoms, and standardized extracts should not have this oxalic acid excess. The root of the rhubarb does, however, contain anthraquinones, laxative substances similar to those found in senna or cascara, which may create a laxative effect. You should discontinue use if you develop diarrhea, abdominal pain or loose stools. Pregnant women, children, and those with severe liver or kidney failure should not use Estrovera, nor should women with estrogen-dependent cancers. Always check with your healthcare provider before starting any supplement. Estrovera is gluten-free and vegetarian. Chances are good that you are either experiencing peri-menopausal or menopause yourself, or you know someone who is. Estrovera has been tested for two years, and it has a stellar safety profile, although health experts do caution that adverse effects from hormone replacement may not emerge for years following its use. The fate of rhubarb? It may become the catch-all when it comes to healing. One study found it may be helpful to improve lung function, and other more preliminary (test tube) studies show promise for helping with diabetes, kidney disease, liver disease, allergies and pancreatitis.